Cheaper to replace front fender? › Cheaper to replace front fender? My front drivers fender has a dent in the side towards the front that has gotten into the body line. Would I be better off finding a good used fender or get a body man to get the dent out? Just thinking about cost. 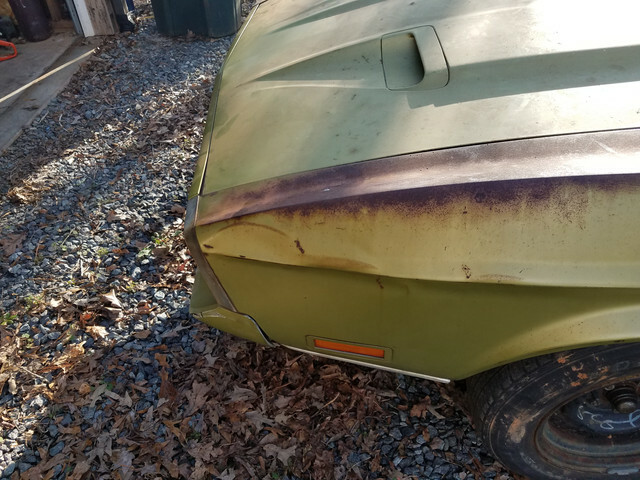 I'm thinking it is going to take a body man several hours to get the dent out to where if I can find a good used fender I would be better off. I would rather not put an aftermarket fender on it. I don't think the steel is as good of quality as an good used OEM would be. Do you have some pics of the dent? Close up? Good used rust free fender is going to be hard to come by. I would pull the fender and pound it out myself. It wouldn't take much hammer and dolly work to get it close enough so an 1/8" of Bondo would take care of the finish. The top dent may have stretched the metal a little, and may require some shrinking. I'm not a good bodyman, don't like doing it, but I wouldn't hesitate taking that on. What's the worse that could happen? Getting a bodyman to finish it or buying a different fender. +1 a little hammer and dolly work and you could get that pretty good in a short period of time. This looks to me a perfect occupation for Saturday afternoon! I'm hitting metal only once in a while, but here my amateur body man eye sees a fender that can be saved without too much troubles. I'd start by cleaning to bare metal on both side, so you actually see and most important feel the problems. You could also make a buck using the other side, by simply reporting with a marker the shape on a piece of paper, then fold that paper once you have the shape and by transparence you have the opposite that you can use to cut some MDF/wood to verify the fender shape, you could even use it to reshape acting as a dolly. Take your time, better a 1000 small hits than big ones and as @Don C says, a tad of bondo will do the rest! I am no body man my self. I have watch my friend who has 35 + years use heat , wet sponge and a dolly to work out dents. He uses less that a 1/8 inch or less of bondo. It is magic to see him work. Also, those fenders are prone to rust at the bottom. It may be good to remove the fender to see what debris is sitting there. Maybe removing and carrying it to someone you trust to fix it. Just a thought here!